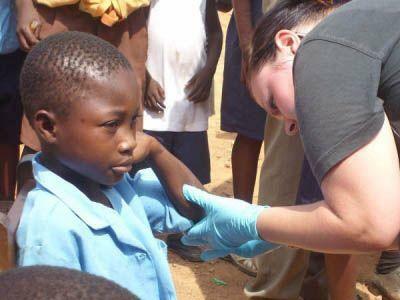 Lizzie Bendle volunteered on a Medicine project with Projects Abroad as a pre-university student in Togo and Ghana in 2001. After deferring her university entry for a year Lizzie decided to use her gap year to gain some worthwhile experience in her chosen field of study - medicine. On her Medicine project, Lizzie was given the opportunity to rotate around a number of different departments including outpatient clinics, surgery, x-ray, maternity, post natal care and a children’s ward. Her placement was varied and as a pre-university volunteer without previous experience Lizzie found herself in the privileged position to be able to pick and choose the departments she wanted to work in. One of the most memorable times on the placement was when she got to visit the local mortuary to watch a post-mortem. Although eye-opening, it confirmed an area of medicine that Lizzie did not want to pursue! Lizzie attributes her decision to become a Paediatric Doctor to the early experience she had on the children’s ward on her Medicine placement. Currently working as a doctor in the Children’s Hospital for Wales in Cardiff, Lizzie hopes to become a consultant paediatrician and would love to return to West Africa to volunteer as a qualified doctor.